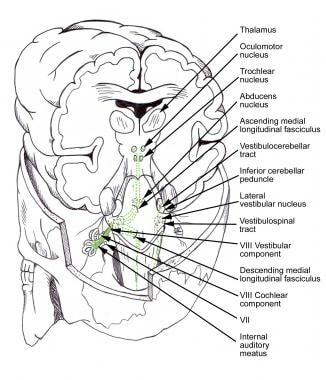 The vertebrobasilar arterial system perfuses the medulla, cerebellum, pons, midbrain, thalamus, and occipital cortex. Occlusion of large vessels in this system usually leads to major disability or death. Vertebrobasilar stroke carries a mortality rate of more than 85%. Because of involvement of the brainstem and cerebellum, most survivors have multisystem dysfunction (eg, quadriplegia or hemiplegia, ataxia, dysphagia, dysarthria, gaze abnormalities, cranial neuropathies). However, many vertebrobasilar lesions arise from small vessel disease and are correspondingly small and discrete. The clinical correlates of these smaller lesions consist of a variety of focal neurologic deficits, depending on their location within the brainstem. Patients with small lesions usually have a benign prognosis with reasonable functional recovery. See the images below regarding vertebrobasilar stroke. The vertebral arteries arise from the subclavian arteries, and as they course cephalad in the neck, they pass through the costotransverse foramina of C6 to C2. They enter the skull through the foramen magnum and merge at the pontomedullary junction to form the basilar artery. Each vertebral artery usually gives off the posterior inferior cerebellar artery (PICA). 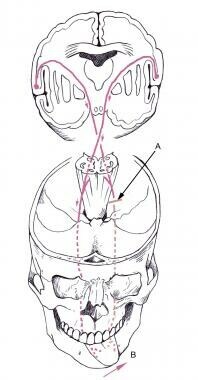 At the top of the pons, the basilar artery divides into 2 posterior cerebral arteries (PCAs). Proximal to its bifurcation into the terminal branches (PCAs), the basilar artery gives off the superior cerebellar arteries that supply the lateral aspect of the pons and midbrain, as well as the superior surface of the cerebellum. The cerebellum is supplied by long circumferential arteries, the PICA, and the anterior inferior and superior cerebellar arteries from the basilar artery. The medulla is perfused by the PICA and by direct, smaller branches from the vertebral arteries. The pons is perfused by small, penetrating branches from the basilar artery and its major branches. 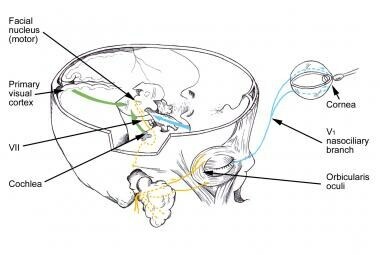 Penetrating arteries from the PCAs perfuse the midbrain and thalamus, and the occipital cortex is perfused by the PCAs. The most common vascular condition affecting the vertebrobasilar system is atherosclerosis, in which plaques cause narrowing and occlusion of the large vessels. The pathology of small vessel disease (affecting arteries 50-200 µm in diameter) is different from that of atherosclerosis, because the small vessels become occluded by a process called lipohyalinosis, which frequently occurs in association with hypertension. Occlusions of these small vessels lead to small, round infarctions called lacunes, which may appear as single lesions or may be distributed as multiple lesions scattered widely throughout the subcortex and brainstem. Lipohyalinosis weakens the vessel wall, and in hypertensive individuals, rupture of the artery may occur, resulting in a focal hemorrhage. Almost all intracerebral hemorrhages originate from the rupture of these small, penetrating vessels. Embolic occlusion of the vertebrobasilar system is not common and usually is artery-to-artery with occlusion of the basilar artery. Donor sites for the emboli typically are the aortic arch, the subclavian artery, and the origin of the vertebral arteries. The frequency, incidence, and prevalence of the vertebrobasilar syndromes vary, depending on the specific area and syndrome involved. Approximately 80-85% of all strokes are ischemic, and 20% of the lesions producing ischemic strokes occur in the vertebrobasilar system. Overall, hemorrhage causes 15-20% of strokes. Although most intracerebral hemorrhages occur in the region of the putamen and thalamus, about 7% of all hemorrhagic lesions involve the cerebellum in the area of the dentate nucleus, and approximately 6% of hemorrhagic lesions involve the pons. In most of the reported series, mortality patients with basilar artery occlusion has been consistently greater than 75-80%. Most survivors of basilar artery occlusion have severe, persisting disability. The onset and duration of symptoms in vertebrobasilar stroke depends, in large part, upon the etiology. Patients with basilar artery thrombosis typically have a waxing and waning course of symptoms, with as many as 50% of patients experiencing transient ischemic attacks for several days to weeks prior to the occlusion. Common clinical findings observed in more than 70% of patients with vertebrobasilar stroke include an abnormal level of consciousness, as well as hemiparesis or quadriparesis, which usually is asymmetric. Pupillary abnormalities and oculomotor signs are common, and bulbar manifestations, such as facial weakness, dysphonia, dysarthria, and dysphagia, occur in more than 40% of patients. 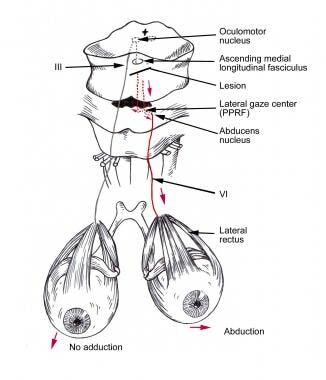 Oculomotor signs usually reflect the involvement of the abducens nucleus; the horizontal gaze center located in the pontine paramedian reticular formation (PPRF), contiguous to the abducens nucleus; and/or the medial longitudinal fasciculus (MLF). Lesions to these structures result in ipsilateral lateral gaze or conjugate gaze palsy. Ocular bobbing is described as a brisk, downward movement of the eyeball with a subsequent return to the primary position. This deficit localizes the lesion to the pons. Other reported signs of pontine ischemia include ataxia and tremor associated with mild hemiparesis. The signs described can occur in different combinations, presenting a diagnostic challenge in lesion localization. This syndrome is most often due to vertebral artery occlusion or, less commonly, to posterior inferior cerebellar artery (PICA) occlusion. 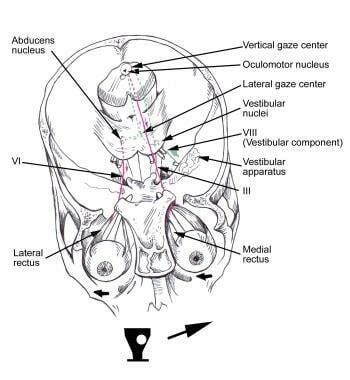 Patients present with nausea, vomiting, and vertigo from involvement of the vestibular system. Contralateral findings include the loss of pain and temperature sense in the body and extremities, indicating involvement of the lateral spinothalamic tract. Other findings include tachycardia and dyspnea (dorsal nucleus of CN X) and palatal myoclonus, a rhythmic involuntary jerking movement of the soft palate, pharyngeal muscles, and diaphragm. Palatal myoclonus sometimes follows infarction of the dentate nucleus of the cerebellum and inferior oliva. The prognosis of patients with the lateral medullary syndrome usually is quite good for functional outcome; however, patients may die in the acute phase from aspiration pneumonia, and death has been reported from sleep apnea in a number of cases. This syndrome is an uncommon lesion resulting from occlusion of a vertebral artery or its branch to the anterior spinal artery; it involves the pyramid, the medial lemniscus, and, sometimes, the hypoglossal nerve. A stroke involving the cerebellum may result in a lack of coordination, clumsiness, intention tremor, ataxia, dysarthria, scanning speech, and even difficulties with memory and motor planning. Early diagnosis of cerebellar infarctions is important, because swelling may cause brainstem compression or hydrocephalus. This dramatic clinical syndrome occurs when there is an infarction of the upper ventral pons. Locked-in syndrome can result from occlusion of the proximal and middle segments of the basilar artery or from hemorrhage involving that region. It can also be caused by trauma, central pontine myelinolysis, encephalitis, or a tumor. Bilateral ventral pontine lesions involving corticospinal and corticobulbar tracts lead to quadriplegia. The patient is unable to speak, to produce facial movement (damage to the corticobulbar tracts), or to look to either side (horizontal eye movement is impaired due to a lesion of bilateral CN VI nuclei). Because the tegmentum of the pons is spared, the patient's consciousness is preserved, with the patient fully awake, sensate, and aware. The only movements preserved are vertical eye movements and blinking. The patient is paralyzed completely and communicates only by blinking. Some recovery of facial muscle movement and horizontal gaze may occur with time or in an incomplete form of this syndrome. Coma may occur with bilateral involvement of the pontine tegmentum or with lesions of the midbrain reticular formation. Coma generally is associated with oculomotor abnormalities, and motor abnormalities may be present. A comatose patient is unresponsive, and the coma may be prolonged when it is due to basilar artery occlusion. Sleep-wake cycles are absent in patients with coma. This syndrome is the manifestation of upper brainstem and diencephalic ischemia caused by occlusion of the rostral basilar artery; the occlusion usually results from an embolism. Varying degrees of involvement of the midbrain, thalamus, and portions of the temporal and occipital lobes may occur and can produce severe disability. Patients present with sudden changes in the level of consciousness, confusion, amnesia, and visual symptoms (eg, hemianopia, cortical blindness, abnormal color vision/color dysnomia). These patients can also demonstrate oculomotor abnormalities, most commonly of the vertical gaze, such as gaze palsy, skew deviation, convergence spasm resulting in pseudoabducens palsy, or convergence-retraction nystagmus. CN III palsy and pupillary abnormalities, including small pupils with decreased light reactivity (diencephalic), large/mid-position and fixed pupils (midbrain), and ectopic or oval pupils, also are frequent. Other abnormalities include varying degrees of weakness, sensory deficits, or posturing. When a patient with a lesion in the right MLF attempts to look to his/her left (ie, away from the involved side), he/she shows no adduction of the right eye and full abduction of the left eye with the end-point abduction nystagmus. By the same logic, in the case of bilateral INO, there is no adduction to either side with nystagmus of the abducting eye in both directions. Convergence is preserved, because the nuclei of CN III and peripheral innervation of the medial recti muscles are intact. Because horizontal gaze requires coordinated activity of the ipsilateral CN III and contralateral CN VI (relative to the lesion), disruption of the communication pathway (ie, the MLF) between the nuclei of CN III (in the midbrain) and CN VI (in the pons) results in the inability of the eye ipsilateral to the lesion to adduct and the contralateral eye to exhibit abduction nystagmus when looking away from the involved side. In elderly patients, INO is caused most often by occlusion of the basilar artery or its paramedian branches. In younger adults, it may occur due to multiple sclerosis (MS), commonly with bilateral involvement. This syndrome is caused by a lesion affecting the PPRF and MLF simultaneously, resulting in ipsilateral conjugate gaze palsy and INO  A patient with this syndrome is completely unable to move the ipsilateral eye, and is able only to abduct the contralateral eye, with resulting nystagmus; the ‘one’ in the syndrome name refers to the former, and the ‘half’ to the latter. 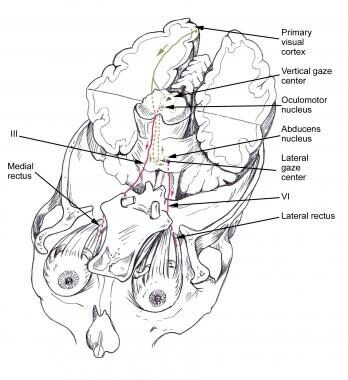 The patient with a lesion in the ipsilateral PPRF or abducens nucleus and MLF connecting to the contralateral CN VI exhibits horizontal gaze palsy when looking toward the side of the lesion and exhibits INO when looking away from the side of the lesion. Associated features may include vertical nystagmus, exotropia of the contralateral eye, and skew deviation. Vertical gaze and convergence generally are preserved. This syndrome occurs after paramedian infarction in the pons and results in ipsilateral lateral rectus palsy (CN VI) with diplopia, complete facial paresis (unilateral CN VII palsy), and contralateral hemiparesis/hemiplegia (corticospinal tract involvement) with sparing of the face. This syndrome is due to obstruction of flow in the long circumferential branches of the basilar artery. This occlusion results in ipsilateral ataxia and coarse intention tremor (indicating involvement of the superior and middle cerebellar peduncles), weakness of mastication and sensory loss in the face (suggesting sensory and motor trigeminal nuclei and tracts), and contralateral loss of all sensory modalities (due to damage to medial lemniscus and spinothalamic tract) with or without facial weakness and hemiparesis (corticospinal tract). Horizontal gaze palsy also may occur. This syndrome may result from lesions to the dorsal tegmentum of the lower pons. The patient exhibits ipsilateral paresis of the whole face (nucleus and fibers of CN VII), horizontal gaze palsy on the ipsilateral side (ie, PPRF with or without CN VI nucleus), and contralateral hemiplegia (corticospinal tract) with sparing of the face. Weber syndrome occurs with an occlusion of the median and/or paramedian perforating branches of the basilar artery. Typical clinical findings include ipsilateral CN III palsy, ptosis, and mydriasis (ie, damage to parasympathetic fibers of CN III) with contralateral hemiplegia. Weakness of the lower face (corticospinal and corticobulbar tracts) may be noted. This syndrome is due to a lesion in the midbrain tegmentum resulting from occlusion of paramedian branches of the basilar artery, the PCA, or both. The patient demonstrates ipsilateral oculomotor palsy, ptosis, and mydriasis (as in Weber syndrome), along with the contralateral involuntary movements, such as those of intention tremor, ataxia, or chorea (due to the involvement of the red nucleus). The most common finding is occipital lobe infarction leading to contralateral hemianopia with macular sparing. Clinical symptoms associated with occlusion of the PCA vary depending on the location of the occlusion and may include the thalamic syndrome, thalamic perforate syndrome, Weber syndrome, cortical blindness, color blindness, failure to see to-and-fro movements, verbal dyslexia, and hallucinations. The disadvantages of CT scanning include a low sensitivity for early ischemia and the presence of significant artifacts caused by the bony structures surrounding the brainstem and cerebellum. MRI and magnetic resonance angiography (MRA) are very helpful in finding occult lesions, such as demyelinating plaques, tumors, vertebrobasilar dolichoectasia, or dissection. [23, 24, 25] MRA has a sensitivity of up to 97% and a specificity of up to 98% when used to identify vertebrobasilar occlusion. A limitation of MRA is its tendency to overestimate the degree of stenosis. This overestimation occurs because the production of a vessel's image in MRA is a based on a flow-related phenomenon; hence, the presence of severe stenosis with significant flow compromise may result in poor visualization of a vessel and cause the MRA image to resemble vascular occlusion. Angiography should be considered a first-line diagnostic test after a CT scan, once it has been decided that recanalization with thrombolysis should be completed. The most important goal of the workup is to establish the type of vascular lesion and the mechanism of the stroke. Transcranial Doppler (TCD) is used in the evaluation of cerebrovascular disease, but it often is inaccurate. Absence of signal in an initial examination does not necessarily mean occlusion. Findings that may affect management include valvular disorders, vegetations, intramural or extramural thrombi, ventricular aneurisms, cardiac tumors (myxoma), right-to-left shunts, and poor ejection fraction. Hemodynamic management should be aimed at minimizing the ischemic injury. Cerebral ischemia impairs the brain’s ability to autoregulate its circulation through vasoconstriction and vasodilatation. Therefore, under ischemic conditions, the cerebral blood flow becomes blood pressure–dependent. An increase in the mean arterial pressure (MAP) results in vasoconstriction. This response limits the perfusion pressure and the blood volume. A decrease in the MAP results in vasodilatation. In normotensive patients, the limits of autoregulation are within the range of 50-150 mm Hg of the MAP. In chronic hypertensive patients, the curve of autoregulation is shifted upward. In the patients with severe cerebral vascular occlusive disease, the MAP and the cerebral perfusion pressure (CPP) become critical in maintaining the cerebral blood flow. CPP is equal to MAP less intracranial pressure (ICP) (ie, CPP = MAP-ICP). Therefore, overzealous treatment of hypertension should be avoided, because it can decrease the cerebral perfusion pressure and exacerbate the ongoing ischemia. No existing information from randomized trials indicates whether treating hypertension is better than not treating it. Based on evidence from experimental models and on data from clinical experience, hypertension should not be treated unless there is evidence of end-organ damage, such as hypertensive encephalopathy, unstable angina, acute myocardial infarction, heart failure, or acute renal failure. Hypertension should be treated when the diastolic blood pressure is greater than 120 mm Hg or when the systolic blood pressure is over 200 mm Hg. Otherwise, when thrombolysis is a strong consideration, the treatment parameters become 110 mm Hg or more for diastolic blood pressure or greater than 180 mm Hg for systolic blood pressure. Commonly used antihypertensives are labetalol and nitroprusside. When diastolic blood pressure is greater than 140 mm Hg, nitroprusside is the preferred drug, provided that no contraindications exist. Patients with hypotension need to be treated to optimize the MAP and, consequently, the blood pressure–dependent cerebral blood flow. Maximal effort should be made to maintain a normal intravascular volume using isotonic solutions. If the MAP continues to be low despite fluid management, vasopressors, such as dopamine, dobutamine, and phenylephrine, should be used. In patients with unknown intravascular volume status or those with complications, such as congestive heart failure and pulmonary edema, a pulmonary artery catheter should be placed to monitor the central venous pressure and the pulmonary capillary wedge pressure. This approach would improve monitoring of the intravascular volume to avoid overload. Early assessment and management of the airway are critical due to the frequent involvement of lower cranial nerves and the impairment of consciousness in patients with brainstem ischemia. Assessment of the respiratory drive, gag reflex, and ability to handle secretions with a forceful cough also is of great importance. Endotracheal intubation may be considered in patients with a decreased level of consciousness and a Glasgow coma score of less than 8. Of the mechanical ventilation modes, pressure support ventilation (PSV) and synchronized intermittent mandatory ventilation are used most often. For patients with good respiratory drive, the most comfortable mode is PSV. In this mode, the ventilator does not deliver a set of breaths but provides enough pressure support to maintain the desired tidal volume, usually in the range of 5-8 mL/kg. Most patients with no pulmonary comorbidities reach this goal with a PSV of 5-10. For patients with poor respiratory drive, synchronized intermittent mandatory ventilation may be a better mode. This form of ventilation delivers a set number of breaths with a set tidal volume, which is synchronized with the patient's inspiratory effort while allowing the patient to take extra breaths. Adding PSV during the extra breaths can minimize the patient's respiratory effort when taking them. Sedation and paralysis should be avoided, because they may obscure the neurologic assessment. Circumstances may exist that require the use of sedation and paralysis (eg, neurogenic hyperventilation) to avoid hypocarbia and worsening of the ischemic process. In 1996, The US Food and Drug Administration (FDA) approved tissue plasminogen activator (tPA) for the treatment of acute ischemic stroke within the first 3 hours of onset. Approval was based on data from the National Institute of Neurological Disorders and Stroke trial, which showed that a higher number of treated versus untreated patients had minimal deficit and minimal or no disability. In 2009, the American Heart Association/American Stroke Association (AHA/ASA) published a science advisory recommending that the time window for tPA administration be increased to 4.5 hours after a stroke, although this change has not been approved by the FDA. Research indicates that tPA is effective in patients even when administered within the 3- to 4.5-hour window, [33, 34, 35] but the AHA/ASA stated that, despite its recommendation, the effectiveness of tPA administration in comparison with other treatments for thrombosis, within that time period, is not yet known. In the early 1980s, Nenci and colleagues reported the first 4 cases of local thrombolysis for vertebrobasilar occlusion, establishing a trend to treat patients with intra-arterial thrombolysis. [14, 37] To date, several case series have been published. The average time to treatment has ranged from 8-48 hours. Overall mortality has decreased from 46-75% to 26-60%. The patient's condition at presentation appears to be the major prognostic factor; patients with quadriplegia and/or coma have demonstrated the least favorable outcomes. Despite the above efforts, intra-arterial thrombolysis for vertebrobasilar occlusion has not been studied systematically in randomized, controlled trials. Of the different agents currently used for thrombolysis (urokinase, prourokinase, streptokinase, tPA), prourokinase and tPA seem to have more selectivity for thrombi. Streptokinase has not been used for stroke since the multicenter European and Australian trials documented a greater mortality in the treated patients. Because of concerns with its production, urokinase is not currently available in the United States. Prourokinase was tested in a prospective, randomized fashion, including only patients with middle cerebral artery stem occlusion. Results showed a better outcome in treated patients, but prourokinase has not been approved for use in acute stroke. At this time, the only viable option for thrombolysis in the United States continues to be tPA. This drug has been studied prospectively in trials involving combined intravenous and intra-arterial therapy, in doses of 0.3 mg/kg, with a maximum of 10-20 mg. Limited experience with the use of GPIIb/IIIa inhibitors, such as abciximab, to block the platelet function and rethrombosis has shown an overall reocclusion rate of approximately 30%. Anticoagulation therapy with heparin has been used, but there is no evidence that it has an impact on outcome. Results from a trial using low–molecular weight heparin intravenously in patients with acute stroke, although negative overall, did show a better outcome at 7 days for patients with large vessel disease. Angioplasty has been performed to treat patients with atherosclerotic basilar artery stenosis. The use of angioplasty is based on the tendency of thrombosis to occur in stenosed arterial segments. Reports describe angioplasty performed in patients with acute vertebrobasilar occlusion, as well as electively. The published case series report a morbidity rate of 0-16% and a mortality rate of up to 33%; however, the role of angioplasty in the treatment of vertebrobasilar occlusion is not well defined. Most patients with vertebrobasilar stroke have a significant degree of disability, due to involvement of the brainstem and cerebellum, with resultant multisystem dysfunction (eg, quadriplegia or hemiplegia, ataxia, dysphagia, dysarthria, gaze abnormalities, cranial neuropathies). They often require ongoing, acute rehabilitation, with attention paid to specific patient issues and the formulation of short-term and long-term care plans. The rehabilitation and planning are performed best in a multidisciplinary and interdisciplinary setting. Rehabilitation services have been shown to play a critical role in recovery from acute stroke. Physicians and nurses play crucial roles on the rehabilitation team; nurses often are the first to suggest initiation of therapy services, because they have the most extensive involvement with the patient. Prior to a discussion of the specific therapy disciplines, address nursing issues in the care of patients with vertebrobasilar stroke. A wide variation in symptoms may be seen with stroke, depending on the severity of the brain damage. Initial nursing intervention involves maintaining skin integrity, establishing a bowel and bladder program, maintaining nutrition, and ensuring the person's safety from injury. Other important nursing issues include communication with the treating clinician in order to initiate therapy services for the assessment of ambulation, transfers, swallowing function, and the performance of activities of daily living (ADL). In some patients, the severity of the deficits makes ambulation impossible; however, patients should be mobilized out of bed and should be actively involved in physical and occupational therapy. Positioning in bed and in a chair assures the patient's comfort and prevents complications from skin breakdown. If the upper extremity is flaccid or paretic, positioning is critical to the prevention of shoulder subluxation and pain from shoulder-hand syndrome. Nursing staff always should involve family members in the care of a person who has sustained a stroke. The patient and family members may be unfamiliar with stroke and its effects. Education must be provided to make the patient and his/her family members aware of the importance of continuing with activities, of appropriate precautions, and of continuing therapy upon discharge to home. Some patients have fluctuating symptoms and signs, which often are related to position. Because of this possibility, precautions are necessary with activities that can be undertaken until the symptoms have stabilized. Physical therapy (PT) and occupational therapy (OT) should be initiated soon after admission, depending on the condition of the patient. Once the symptoms have stabilized, patients should be mobilized out of bed, which will allow them to participate in full PT and OT activities. The physical therapist is responsible for retraining of gross motor skills, such as gait, balance, transfers, bed mobility, and wheelchair mobility. The physical or occupational therapist may be involved with assessing the patient for the proper wheelchair and seating system. The physical therapist also develops a PT program and instructs the patient in general strengthening and range of motion. Training of the patient and family members in the use of lower extremity orthotics may be necessary to provide for functional mobility. Vestibular evaluation and training are very important, due to a high prevalence of vestibular and cerebellar involvement in vertebrobasilar strokes. Patients often need extensive balance and gait training. Evaluation always should begin with a detailed and focused history. A premorbid vestibular status determination is of great importance, because dizziness is the third most frequent complaint during physician visits from patients aged 65 years and the most frequent complaint from patients aged 75 years and older. An exercise-based approach has been successful in the treatment of vestibular disorders, due to several possible mechanisms. These include adaptation, substitution, habituation, and repositioning. 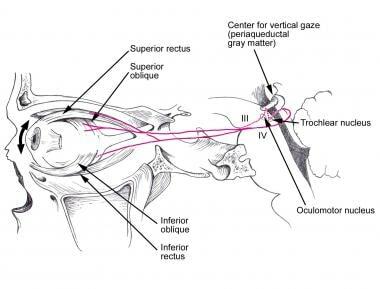 With adaptation by the central vestibular system, the brain modulates the gain of the vestibular response, attempting to correct for a retinal slip (error signal) caused by the decreased gain of the VOR. The VOR training strategy includes focusing on a stationary or moving target while rotating the head, resulting in a retinal slip that facilitates adaptation. Substitution for the loss of function by the remaining intact visual and somatosensory systems is used in treating patients with bilateral vestibular lesions (complete or partial loss of both labyrinths). Habituation for postural vertigo results in decreased response to repeated provoking stimuli. Patients move into the provoking position 2-3 times during each session, and repeat these sessions 3-5 times per day. Repositioning maneuvers (eg, Epley maneuver) are used for positional vertigo, based on the mechanical displacement of the debris from the affected canal(s) by a series of head movements. Alternating eye patches or prisms can help diplopia. General conditioning also is incorporated into the overall rehabilitation plan, encouraging an increase in the performance of ADL as tolerated. OT is used for retraining fine motor skills that are needed to perform ADL (eg, dressing, bathing, grooming), as well as for improving hand and arm function. OT also is involved in general strengthening, wheelchair mobility, upper extremity orthotics, and the evaluation of needs for adaptive equipment, as well as in family training and cognitive retraining for safety and ADL. Speech therapy (ST) is used for cognitive retraining, speech and language skills, safety skills, swallowing assessment, and family training. In patients with dysphagia from brainstem lesions, the cricopharyngeus muscle may fail to open sufficiently, resulting in an impaired passage of the bolus from the pharynx to the esophagus. Increased pooling of a bolus in the vallecula and/or pyriform sinuses, which spills into the airway, poses a significant risk for aspiration and pneumonia. Evaluation of these patients should be thorough and should include a videofluoroscopy with a modified barium swallow to assess for silent aspiration. The speech and language therapist often performs the initial swallowing evaluation and determines the risk for aspiration and the consistency of the patient's diet. The patient's vocalization and possible reading, writing, and processing deficits also are addressed. Interventions for the prevention of aspiration include compensatory strategies, such as oromotor exercises and postural changes while swallowing, as well as facilitative strategies (eg, modification of bolus consistency, volume, delivery). Surface electromyography biofeedback for dysphagia has shown promising results. Surface electromyography is used in training a patient to perform maneuvers that compensate for the weak swallow. The Mendelsohn maneuver, for example, requires voluntary maintenance of the thyroid cartilage in an elevated position for a few seconds, resulting in further widening of the opening of the cricopharyngeus muscle and easier passage of the food bolus through to the esophagus. The patient observes the plateau (as opposed to the peak) of the generated waveform on the screen, reinforcing the concept of muscle activation in the desired position (thyroid cartilage elevation). The patient should be on a nothing-by-mouth restriction until the swallowing mechanism has been assessed and cleared and the airway has been protected. If there is a high risk of aspiration, a nasogastric or nasoduodenal tube should be placed, although neither completely eliminates the aspiration risk. If the swallowing abnormalities are so severe that recovery is expected to take weeks or months, then a gastrostomy tube should be placed either surgically or percutaneously. The recreational therapist should concentrate on finding alternative recreational activities for patients who are unable to perform at their premorbid level. Engaging in these activities provides a creative outlet and a positive emotional gain that potentially enhance the patient's psychological recovery. In addition to consultations with physical, occupational, and speech therapists, consultation with a neuropsychologist and a social services worker may also be required in the management of patients with vertebrobasilar stroke. Evaluation by a neuropsychologist is recommended to screen for depression, family dysfunction, coping skills, and subtle cognitive, memory, or processing deficits. All of these may affect future participation in and compliance with rehabilitation. The social services department is responsible for coordinating intake and planning discharge. Depending on the setting, the social services representative may be a licensed social worker or may instead be someone with a more limited background. Home health agencies typically employ licensed social workers, but in nursing homes, the social worker usually is not licensed or certified. Patients should follow up with the primary care provider, neurologist, and other specialists, including the physiatrist, and continue with the outpatient rehabilitation program. The patient requires continued reassessment of various factors (eg, functional gains, psychological status, mood, the need for further equipment, home and other modifications, skin care, bowel and bladder function, spasticity management, pain, vocational needs, and social issues). Strict risk factor control is important to decrease the risk of stroke recurrence. Prevention strategies depend on the primary cause of the stroke. Patients with a definite cardioembolic source, such as atrial fibrillation, should be treated with warfarin to maintain an international normalized ratio of 2-3. Treatment of patients with basilar artery stenosis and, for that matter, vertebral artery stenosis is less clear. Retrospective evidence suggests that warfarin is better than aspirin for the prevention of stroke recurrence in patients with greater than 50% basilar artery stenosis. The ongoing warfarin-aspirin trial for symptomatic intracranial disease will provide valuable information in that regard. Several oral anticoagulant medications are in various stages of clinical trials for the prophylaxis of ischemic thromboembolic stroke. If approved for use, the potential of such drugs in the arena of stroke treatment is significant. Patients with acute basilar artery occlusion have a mortality rate of more than 85%. Survivors usually are left with significant neurologic deficit. For symptomatic patients who survive, the risk of recurrent stroke is 10-15%. For patient education information, see the Stroke Center, as well as Stroke. How is vertebrobasilar stroke differentiated from hemispheric stroke? What is the anatomy of vertebral and basilar arteries relative to vertebrobasilar stroke? What is the pathophysiology of vertebrobasilar stroke? What are the risk factors for vertebrobasilar stroke? What is the prevalence of vertebrobasilar stroke? Which clinical history findings are characteristic of vertebrobasilar stroke? What are the signs and symptoms of vertebrobasilar stroke? Which physical findings are characteristic of vertebrobasilar stroke? Which physical findings help locate the lesions of vertebrobasilar stroke? What are the possible complications of vertebrobasilar stroke? Which neurologic syndromes are associated with vertebrobasilar artery stroke? What are the signs and symptoms of lateral medullary (Wallenberg) syndrome in vertebrobasilar stroke? What is the prognosis of lateral medullary (Wallenberg) syndrome? What are the signs and symptoms of medial medullary syndrome in vertebrobasilar stroke? What are the signs and symptoms of cerebellar infarction in vertebrobasilar stroke? What are the signs and symptoms of locked-in syndrome in vertebrobasilar stroke? What are the signs and symptoms of top-of-the-basilar syndrome in vertebrobasilar stroke? What are the signs and symptoms of internuclear ophthalmoplegia (INO in vertebrobasilar stroke? What are the signs and symptoms of one-and-a-half syndrome in vertebrobasilar stroke? What are the signs and symptoms of ventral pontine (Millard-Gubler) syndrome in vertebrobasilar stroke? What are the signs and symptoms of upper dorsal pontine (Raymond-Cestan) syndrome in vertebrobasilar stroke? What are the signs and symptoms of lower dorsal pontine (Foville) syndrome in vertebrobasilar stroke? What are the signs and symptoms of ventral midbrain (Weber) syndrome in vertebrobasilar stroke? What are the signs and symptoms of dorsal midbrain syndrome in vertebrobasilar stroke? What are the signs and symptoms of posterior cerebral artery occlusion in vertebrobasilar stroke? Which conditions should be included in the differential diagnoses of vertebrobasilar stroke? Which lab studies are performed in the workup of vertebrobasilar stroke? Which patients should be evaluated for hypercoagulable states during the workup for vertebrobasilar stroke? Who should undergo testing of creatine kinase, cardiac isoenzymes, and troponin levels in the workup of vertebrobasilar stroke? What is the role of CT scanning in the diagnosis of vertebrobasilar stroke? What is the role of MRI in the diagnosis of vertebrobasilar stroke? What is the role of angiography in the diagnosis of vertebrobasilar stroke? What is the role of ultrasonography in the diagnosis of vertebrobasilar stroke? What is the role of electrocardiography in the diagnosis of vertebrobasilar stroke? What is the role of echocardiography in the workup of vertebrobasilar stroke? When is admission to the ICU indicated for the treatment of vertebrobasilar stroke? What is included in hemodynamic management in patients with vertebrobasilar stroke? What is included in respiratory management for the treatment of vertebrobasilar stroke? What is the role of thrombolytic therapy in the treatment of vertebrobasilar stroke? What are the eligibility criteria for thrombolytic therapy in vertebrobasilar stroke? What is the efficacy of thrombolytic therapy for vertebrobasilar stroke? What is the role of anticoagulation therapy in the treatment of vertebrobasilar stroke? What is the role of angioplasty in the treatment of vertebrobasilar stroke? How is vertebrobasilar stroke treated? What is included in the long-term inpatient care for vertebrobasilar stroke? What is the role of rehabilitation after a vertebrobasilar artery stroke? What is included in nursing care of patients with vertebrobasilar stroke? What is the role of physical therapy in the treatment of vertebrobasilar stroke? Which clinical tests should be performed during rehabilitation of a vertebrobasilar stroke? What is included in an exercise-based approach to rehabilitation of vertebrobasilar stroke? What is the role of occupational therapy in the treatment of vertebrobasilar stroke? What is the role of speech and swallowing therapy in the treatment of vertebrobasilar stroke? What is the role of recreational therapy in the treatment of vertebrobasilar stroke? Which consultations are beneficial to patients with vertebrobasilar stroke? What is included in the follow-up care of patients with vertebrobasilar stroke? How are recurrent vertebrobasilar strokes prevented? What is the prognosis of vertebrobasilar stroke? Whedon JM, Song Y, Mackenzie TA, Phillips RB, Lukovits TG, Lurie JD. Risk of stroke after chiropractic spinal manipulation in medicare B beneficiaries aged 66 to 99 years with neck pain. J Manipulative Physiol Ther. 2015 Feb. 38 (2):93-101. [Medline]. Cohen JE, Leker RR, Gomori JM, et al. Emergent revascularization of acute tandem vertebrobasilar occlusions: Endovascular approaches and technical considerations-Confirming the role of vertebral artery ostium stenosis as a cause of vertebrobasilar stroke. J Clin Neurosci. 2016 Dec. 34:70-6. [Medline]. Amin-Hanjani S, Pandey DK, Rose-Finnell L, et al. Effect of Hemodynamics on Stroke Risk in Symptomatic Atherosclerotic Vertebrobasilar Occlusive Disease. JAMA Neurol. 2016 Feb 1. 73 (2):178-85. [Medline]. Amin-Hanjani S, Turan TN, Du X, et al. Higher Stroke Risk with Lower Blood Pressure in Hemodynamic Vertebrobasilar Disease: Analysis from the VERiTAS Study. J Stroke Cerebrovasc Dis. 2017 Feb. 26 (2):403-410. [Medline]. Kamper L, Rybacki K, Mansour M, et al. Time management in acute vertebrobasilar occlusion. Cardiovasc Intervent Radiol. 2008 Aug 13. [Medline]. Yuan MZ, Li F, Tian X, Wang W, Jia M, Wang XF, et al. Risk factors for lung infection in stroke patients: a meta-analysis of observational studies. Expert Rev Anti Infect Ther. 2015 Oct. 13 (10):1289-98. [Medline]. Schneider JI, Olshaker JS. Vertigo, vertebrobasilar disease, and posterior circulation ischemic stroke. Emerg Med Clin North Am. 2012 Aug. 30(3):681-93. [Medline]. Adams RJ, Chimowitz MI, Alpert JS, et al. Coronary risk evaluation in patients with transient ischemic attack and ischemic stroke: a scientific statement for healthcare professionals from the Stroke Council and the Council on Clinical Cardiology of the AHA/ASA. Circulation. 2003 Sep 9. 108(10):1278-90. [Medline]. [Full Text]. Bahouth MN, LaMonte MP. Acute ischemic stroke: evaluation and management strategies. Top Adv Pract Nurs. 2005. 5(4):[Full Text]. Kim D, Liebeskind DS. Neuroimaging advances and the transformation of acute stroke care. Semin Neurol. 2005 Dec. 25(4):345-61. [Medline]. Pikija S, Magdic J, Hojs-Fabjan T. Calcifications of vertebrobasilar arteries on CT: detailed distribution and relation to risk factors in 245 ischemic stroke patients. Biomed Res Int. 2013. 2013:918970. [Medline]. [Full Text]. Puetz V, Sylaja PN, Coutts SB, et al. Extent of hypoattenuation on CT angiography source images predicts functional outcome in patients with basilar artery occlusion. Stroke. 2008 Sep. 39(9):2485-90. [Medline]. Sylaja PN, Puetz V, Dzialowski I, et al. Prognostic value of CT angiography in patients with suspected vertebrobasilar ischemia. J Neuroimaging. 2008 Jan. 18(1):46-9. [Medline]. Kidwell CS, Chalela JA, Saver JL, et al. Comparison of MRI and CT for detection of acute intracerebral hemorrhage. JAMA. 2004 Oct 20. 292(15):1823-30. [Medline]. [Full Text]. Aichner FT, Felber SR, Birbamer GG. Magnetic resonance imaging and magnetic resonance angiography of vertebrobasilar dolichoectasia. Cerebrovasc Dis. 1993. 3:280-4. Kitanaka C, Tanaka J, Kuwahara M, et al. Magnetic resonance imaging study of intracranial vertebrobasilar artery dissections. Stroke. 1994 Mar. 25(3):571-5. [Medline]. Knepper L, Biller J, Adams HP Jr, et al. MR imaging of basilar artery occlusion. J Comput Assist Tomogr. 1990 Jan-Feb. 14(1):32-5. [Medline]. Rem JA, Hachinski VC, Boughner DR, et al. Value of cardiac monitoring and echocardiography in TIA and stroke patients. Stroke. 1985 Nov-Dec. 16(6):950-6. [Medline]. Reeves MJ, Arora S, Broderick JP, et al. Acute stroke care in the US: results from 4 pilot prototypes of the Paul Coverdell National Acute Stroke Registry. Stroke. 2005 Jun. 36(6):1232-40. [Medline]. [Full Text]. 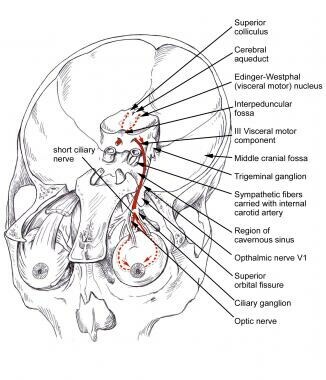 Huemer M, Niederwieser V, Ladurner G. Thrombolytic treatment for acute occlusion of the basilar artery. J Neurol Neurosurg Psychiatry. 1995 Feb. 58(2):227-8. [Medline]. [Full Text]. Del Zoppo GJ, Saver JL, Jauch EC, et al. Expansion of the time window for treatment of acute ischemic stroke with intravenous tissue plasminogen activator. A science advisory from the American Heart Association/American Stroke Association. Stroke. 2009 May 28. [Medline]. [Full Text]. Hacke W, Kaste M, Bluhmki E, et al. Thrombolysis with alteplase 3 to 4.5 hours after acute ischemic stroke. N Engl J Med. 2008 Sep 25. 359(13):1317-29. [Medline]. [Full Text]. Wahlgren N, Ahmed N, Davalos A, et al. Thrombolysis with alteplase 3-4.5 h after acute ischaemic stroke (SITS-ISTR): an observational study. Lancet. 2008 Oct 11. 372(9646):1303-9. [Medline]. Adams HP Jr, del Zoppo G, Alberts MJ, et al. Guidelines for the early management of adults with ischemic stroke: a guideline from the American Heart Association/American Stroke Association Stroke Council, Clinical Cardiology Council, Cardiovascular Radiology and Intervention Council, and the Atherosclerotic Peripheral Vascular Disease and Quality of Care Outcomes in Research Interdisciplinary Working Groups: the American Academy of Neurology affirms the value of this guideline as an educational tool for neurologists. Stroke. 2007 May. 38(5):1655-711. [Medline]. [Full Text]. Hatano T, Tsukahara T. Endovascular treatment for intracranial vertebrobasilar artery stenosis. Acta Neurochir Suppl. 2014. 119:83-9. [Medline]. Alexander MD, Rebhun JM, Hetts SW, et al. Lesion location, stability, and pretreatment management: factors affecting outcomes of endovascular treatment for vertebrobasilar atherosclerosis. J Neurointerv Surg. 2015 Mar 20. [Medline]. Nair SS, Surendaran AJ, Menon JR, Sreedharan SE, Sylaja PN. Persistent post-stroke dysphagia treated with cricopharyngeal myotomy. Ann Indian Acad Neurol. 2016 Apr-Jun. 19 (2):249-51. [Medline]. [Full Text]. Ois A, Gomis M, Rodríguez-Campello A, et al. Factors associated with a high risk of recurrence in patients with transient ischemic attack or minor stroke. Stroke. 2008 Jun. 39(6):1717-21. [Medline]. Albers GW, Diener HC, Frison L, et al. Ximelagatran vs warfarin for stroke prevention in patients with nonvalvular atrial fibrillation: a randomized trial. JAMA. 2005 Feb 9. 293(6):690-8. [Medline]. [Full Text]. Kim YW, Hong JM, Park DG, et al. Effect of Intracranial Atherosclerotic Disease on Endovascular Treatment for Patients with Acute Vertebrobasilar Occlusion. AJNR Am J Neuroradiol. 2016 Jun 16. [Medline]. Kim JT, Park MS, Choi KH, et al. Clinical Outcomes of Posterior Versus Anterior Circulation Infarction With Low National Institutes of Health Stroke Scale Scores. Stroke. 2017 Jan. 48 (1):55-62. [Medline]. [Full Text]. Bouslama M, Haussen DC, Aghaebrahim A, et al. Predictors of Good Outcome After Endovascular Therapy for Vertebrobasilar Occlusion Stroke. Stroke. 2017 Dec. 48 (12):3252-7. [Medline].